Sixteen-year-old Dianna lights up when describing the weekly routine with her mentor, Kelly Vang. "Kelly and I meet once a week at noon," Dianna said. "It's not super strict, but it's not playful either. It's in between, which helps me be more mature." Aidan, a fifth-grader, describes his mentoring group this way: "We start by saying hello to Mr. Moore, shaking his hand, then sitting down as a group. We have to dress nice and wear a shirt and tie. He wants us to act like gentlemen. Gentlemen don't start fights, they stop fights." Dianna and Aidan are Fresno Unified students receiving the personal time and attention that can make an important difference for a student -- a relationship with a caring and encouraging mentor. Fresno Unified's mentoring program began in 2008 and has grown to 739 mentors at 35 school sites. Fresno Unified serves 74,000 students at over 100 school sites -- meaning there are many more students waiting for a mentor to make the difference for them. For those interested in mentoring, the district offers a variety of ways to get involved based on schedules and preferences. Options include individual or group mentoring, and mentors can request grade levels and school site locations. The application packet is available on the Fresno Unified website, and fingerprinting services are free. Hundreds of students are waiting to be matched with a mentor right now. As part of its efforts to recruit new mentors, Fresno Unified held the inaugural Mentoring Matters event on Dec. 10 with the goal of attracting 100 African-American male mentors. 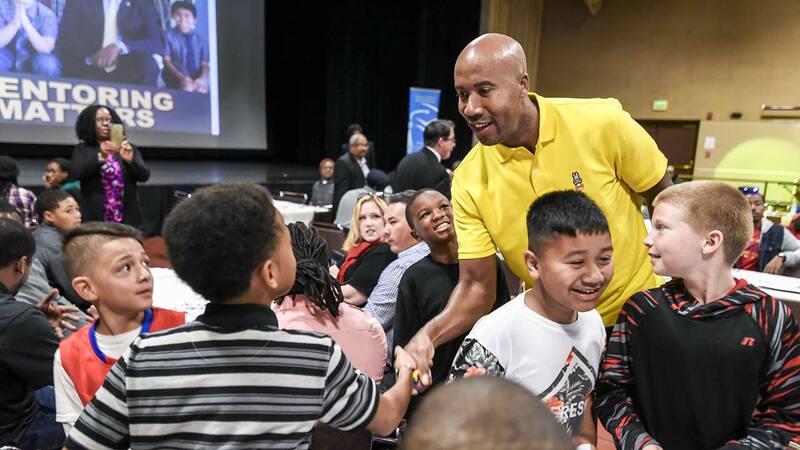 NBA champion and Edison High School alumnus Bruce Bowen spoke to potential mentors about providing guidance and being accountable to the students, speaking from years of experience as a mentor. "The job is upon you all, and it's not for the weak," Bowen said. Aidan and other boys at Kratt Elementary School meet weekly with their mentor, Nathan Moore. The story of Aidan and his mentoring group was shared on Facebook, where Aidan's mother, Kelly, commented, "My heart is so full. Nate Moore, you are an amazing man. Keep doing what you do." To join the amazing adults making a difference in the lives of young people, complete an online mentor application at www.fresnounified.org, search: mentor. - E-Mentoring -- Weekly email correspondence with a selected student; a great option for volunteers with limited time and transportation. - One-on-One Mentoring -- Mentors meet weekly on the school site with their mentee. Schedules can be arranged to coordinate with both the mentor and student before school, during lunch, or after school. - Group Mentoring -- This is mentoring with provided curriculum. Mentors lead weekly meetings at the school site, coordinate off-campus trips, and invite guest speakers as part of the experience. - Community-Based Mentoring -- Introduces students to new surroundings, such as job shadowing, academic enrichment, field trips, athletic events, presentations, and/or special community events.